WIMBLEDON – Every tennis fans and expert wanted to be the first to predict that exact moment Rafael Nadal’s career would start sliding down the other side of the impossible high hill he has climbed. The thing is, most figured it would be his body that would let him down, that the wear and tear of his signature grinding style on those balky knees would eventually be his downfall, probably before his time and certainly long before his heart and desire ever wavered. So the shocking and somewhat unexpected thing is, at age 29 and healthy, it is Nadal’s mind, his will, his confidence, that are betraying him instead. 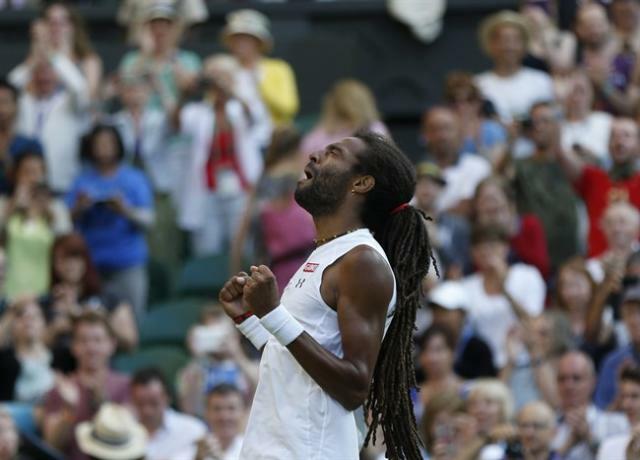 And the shocking thing about the Spaniard’s 7-5 3-6 6-4 6-4 loss to flashy serve-and-slasher Dustin Brown of Germany in the second round at Wimbledon Thursday was that it wasn’t even THAT much of a shock. It almost seemed that if Nadal did turn it around and come back to win, it would be because Brown faltered at the finish line and not because Nadal himself would flip the switch. He did all the right things He prepared properly. Nadal even had an extra week on the grass this year to adapt; he didn’t have to quickly turn it around, as he has so often, from a Sunday final at Roland Garros to a Monday practice on the grass at Queen’s Club. And yet, the result was the same; a fourth consecutive loss at Wimbledon to a player ranked No. 100 or lower. A third loss in four years in the first or second rounds. The forehand failed him, as it has so often of late. But somehow it felt like more than that; the lion never roared on Centre Court. Brown’s game plan, and the reason why he has his best results on faster courts, is to rob his opponent of time and rhythm. He brings a pretty big serve to the dance as well. It’s not just the quick points; his time between points is at the opposite end of the speed scale with the fastidiously deliberate Nadal, who probably felt as though each Brown serve was coming at him before he even had a chance to shake off the previous point and adjust his shorts. Brown finished the job off with a level of play that is as risky as it is rewarding, a go-for-broke style that is nearly impossible to keep up over a best-of-five set match, which is why the German-Jamaican’s ranking is there it is. On Thursday, he kept it up. There were other moments. Nadal was up a break in the first set when he tried a tweener. He didn’t make it; coincidence or not, he coughed up two breaks and dropped the first set. Early in the third, at game point, after saving a break point, he offered up two double-faults in a row. At the beginning of the fourth set, he missed some inside-out forehands – long the Nadal signature shot – by such a wide margin. So off-balance he was, so uncertain. 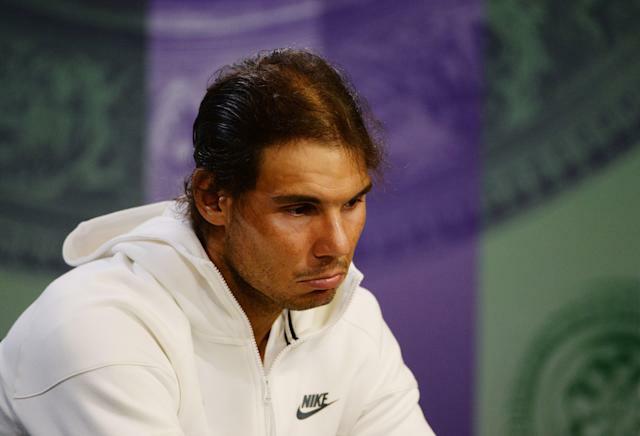 The Spaniard, who always speaks about “finding solutions”, had absolutely none for Dustin Brown. And it’s not as though he didn’t know what was coming. A year ago at the Wimbledon warmup tournament in Halle where the grass is even quicker than at the All-England Club, Brown defeated him 6-4, 6-1. The solutions Nadal often talks about are contained in a small, self-limiting bubble within the greater picture. They usually involve working harder, practicing more and with more intensity. But in this case, the most obvious option was one he could not take. So often you hear commentators wax poetic about Nadal’s volleys, constantly praising him as one of the most underrated volleyers in the game, with exemplary technique and good touch. Lost in that praise is the fact that Nadal simply doesn’t come to net all that much and when he does, it’s to follow up topnotch approach shots, making those finishing volleys almost a formality. There’s no secret to how you try to blunt the effectiveness of a serve-volleyer, even if those tactics have fallen rather into disuse in the current tennis climate: you get to the net before he does. Players who play that style come in because they don’t have the groundstrokes to stay with a great baseliner. They come in to take advantage of their own strengths. What they DON’T do is pass a net-rusher well themselves. It’s the type of adjustment that simply isn’t in Nadal’s vocabulary, not because he’s not capable of executing just about anything on a tennis court, but because he’s never had to. He serve-volleyed a couple of times against Brown, but only late in the game, and not nearly enough to throw off Brown’s rhythm the way the German was so effectively throwing off his. “The point is whatever I do is to take him out of his comfort zone. If I would stay in the back and rally with him, left, right, that would not be a very good match for me. I know that,” Brown said. Brown had never even set foot on Centre Court before this match. “I thought I would freak out a little bit. I don’t know if was the match in Halle, but it felt very familiar, being with him on the court and having won the last match,” Brown said. Instead, it was Nadal who freaked out a little bit. Nadal said the loss was a tough one to take on the spot, but he’s not the type to let it eat away at him for a couple of weeks. “Just accept,” as he always says. So far in this Grand Slam season, Nadal has two quarter-finals and a second round. The major he has had the least success at, the U.S. Open, is the only one remaining. So this year may indeed be the year, when his career is analyzed in hindsight, that the trip down the other side of the hill began. When his mind and spirit, not his body, let him down. But at 29, you have to think he still has some solutions in him, especially if the body will allow it. The trick will be to find them. They probably don't lie in more practice, but somewhere else entirely.